Lenny Kravitz performed his current single, “Low”, on NBC-TV’s The Tonight Show starring Jimmy Fallon on September 17. On hand to promote his new album, “Raise Vibration”, the rocker first appeared on the episode alongside his daughter, Zoe, as contestants in a game of Lip Sync Charades that saw them compete against Fallon and fellow guest Reese Witherspoon. 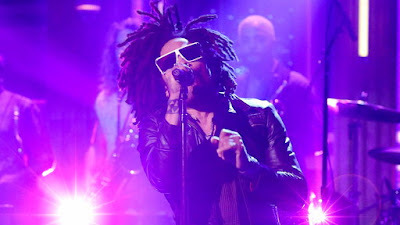 Kravitz later returned for a chat with the host, where he spoke about a paparazzi photo of him with a scarf that went viral as a meme, his extensive collection of music memorabilia – which led to a story about Bob Dylan – and the inclusion of Michael Jackson on the latest single from his eleventh studio album. "We'd worked together years ago,” says the singer. “I wrote and produced a song with him 'Another Day'.... when I was writing this song, it sounded like a song that I could've given to Michael and I kept hearing his voice. I wanted to have his presence on the track." Kravitz will begin a brief US tour in support of “Raise Vibration” in Atlanta, GA on September 21. In sync with opening night, Kravitz will launch a vinyl reissue series with the re-release of his first five albums.